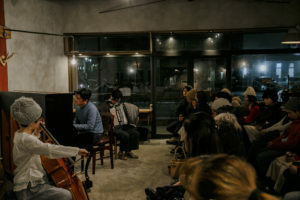 This report is about our experimental concert “One Hour Poetry 2018” by a poet and two musicians at Wanderlust in Nagano-city on 25th of March in 2018. 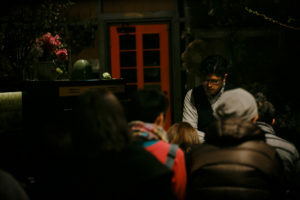 This report is about our experimental concert “One Hour Poetry 2018” by a poet and two musicians at sioribi in Matsumoto-city on 9th of March in 2018. 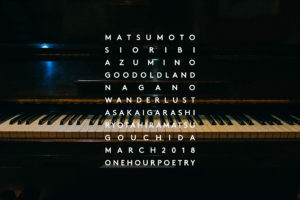 The experimental concert “One Hour Poetry” is going to hold, in Matsumoto on the 9th of March, in Azumino on the 10th of March, in Nagano on the 25th of March, by a poet and two musician. It will become the experimental improvised performance with poems, piano, accordion and cello. 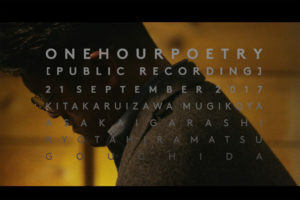 Finally we show the movie trailer of “One Hour Poetry” which was held at Mugikoya in Kitakaruizawa on the 21st Sep 2017. 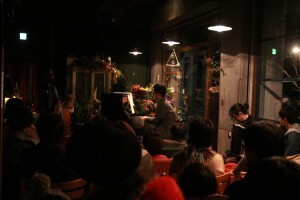 This report is about a concert “One Hour Poetry” held in Nagano and Tokyo by a poet and two musician in November 2016.